The best wellness speakers all have one thing in common: passion. If there is one thing Dr. Gena Bofshever, owner and founder of Dr. Gena Chiropractic in Plantation, Florida, is passionate about, it’s chiropractic care, wellness, and maintaining a positive mindset. For almost ten years, Dr. Gena has built her reputation as a leader in family chiropractic care, chiropractic care for expectant mothers, chiropractic care for newborns and infants, and wellness education for all of her patients. And when you become a leader in your industry, you become sought-after to share your passion with others. In fact, Dr. Gena is a so passionate about the wellness of others, that she travels around the country sharing her knowledge of what it means to live a true, healthy life. 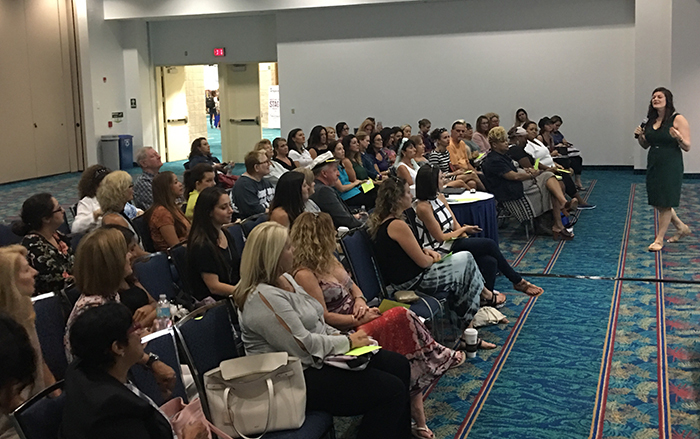 No matter the stage, audience size, or topic of her talk, the one constant that is guaranteed in any Dr. Gena presentation is a level of energy unlike any other, along with a breakdown of The 5 Pillars of Optimal Health - a lifestyle she proudly lives by. Dr. Gena shares the power of abiding by these five pillars, in tandem, to help others live their best and healthiest lives. Apart from the benefits of chiropractic care, Dr. Gena brings her amazing energy to help inspire audience members with her powerful speaking engagements focusing on the benefits of keeping a positive mindset. Because positivity is at the forefront of all that she does, it’s not uncommon that you’ll find Dr. Gena gracing the stage at events such as wellness expos, success summits, mindfulness workshops, and events designed to empower and motivate women. Aside from speaking, Dr. Gena has been known to lead others in community activities to bring awareness to wellness beliefs and gives of her time to multiple charities . She participated in a mission trip to the Dominican Republic with a group of hundreds of Chiropractors, to provide care to women and children in underprivileged areas. Through her work with the Boys and Girls Club, Dr. Gena was nominated for the 100 Outstanding Women of Broward County award. Additionally, she volunteers for Mothers Against Drunk Driving (MADD) and the PACE Center for Girls. Recently, she was also a committed planner and participant with Deliver the Dream, which raises money for the families of people with disabilities to be able to engage in fun, stress-relieving health retreats. Dr.iGena rounds out a lifestyle that nourishes her soul as a member on numerous boards and organizations, including Fem City and The Plantation Chamber of Commerce. Your health is in your hands, but Dr. Gena’s hands, and superior knowledge, are here to help. Send an Email to book Dr. Gena for you organization.